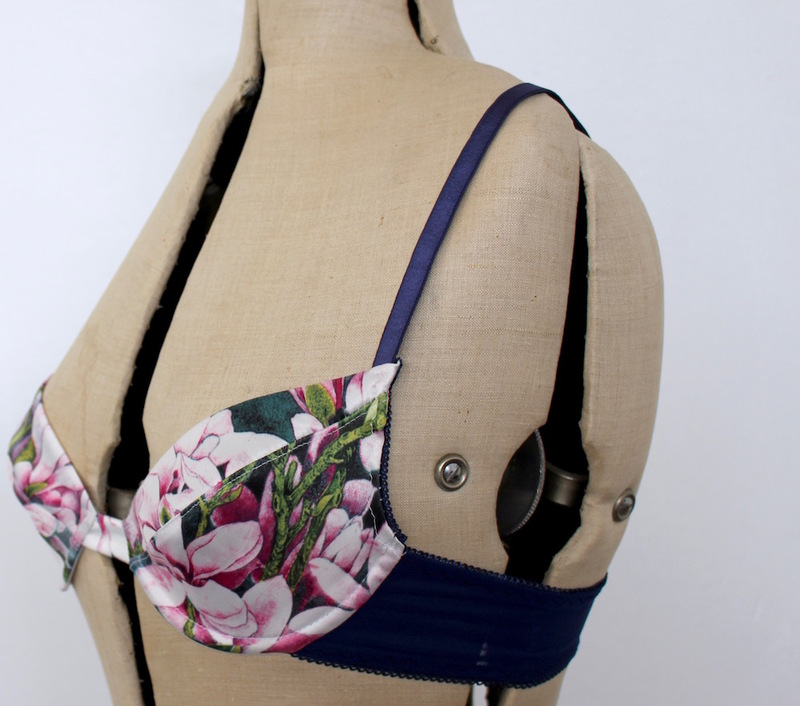 I am so excited about this Push Up Bra pattern by Merckwaerdigh. This is a partial band bra with plunge underwires and two-part cup with diagonal seam. It comes with optional padded inserts that you can make for extra boost. I skipped those. The floral version was made with a kit from Lingerie Findings, using her stretch satin on the cups, lined with sheer cup lining. I broke the rules on the black version by using unlined, stretch lace on the upper cup. I’m not sorry. It’s divine to wear! The lower cup is made with two layers of woven polyester. The band was unlined stretch lace and picot elastic. I hope it holds up to wear and tear, but it’ll be an experiment in durability. 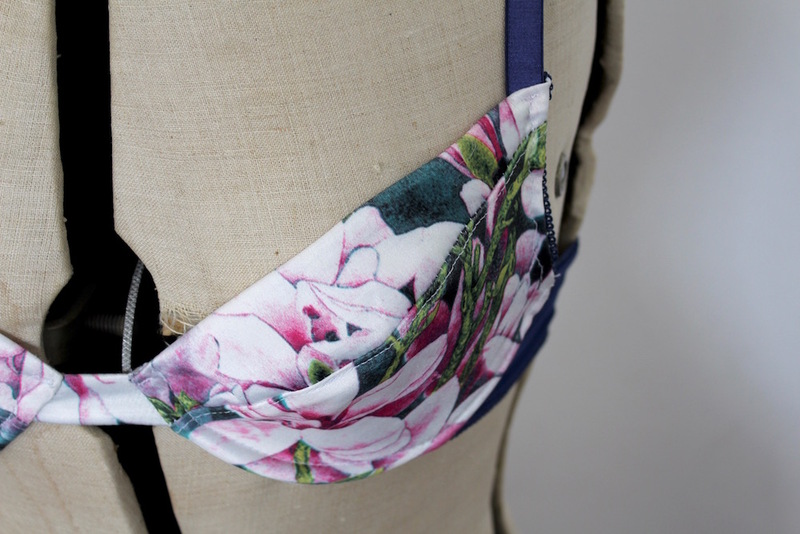 I also crossed the straps at the back so that I can wear it under racerback tops, like my Ella. Construction was uncomplicated. In fact, if you’ve made bras before, you can mostly follow your nose. Just don’t forget to add your seam allowances to the pattern pieces. Also, don’t be put off by the reviews saying how hard these patterns are. It’s not ideal for a first time bra-maker. 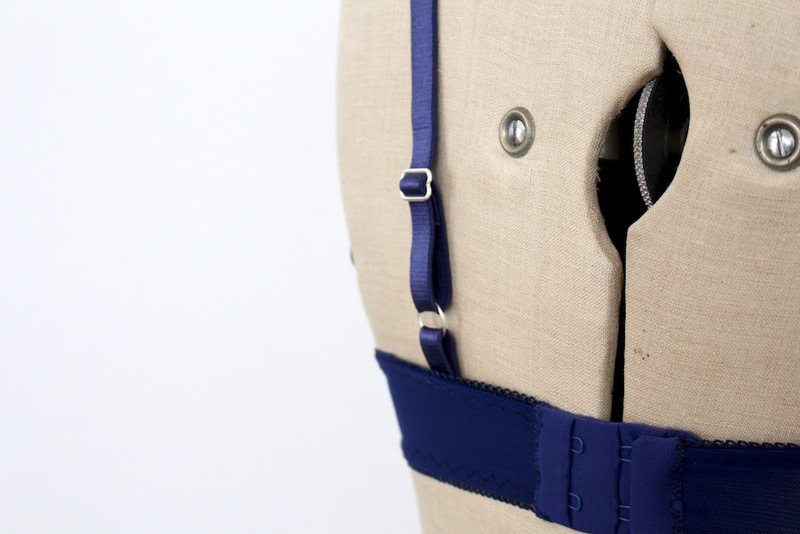 But fine for anyone else confident behind the sewing machine. I’m curious about her sizing though. All sizes are a B cup (graded up for each band size) and to make larger or smaller cup sizes, you alter the band length. It’s an interesting concept. Being a B cup myself, I’m keen to make a bra for someone with a larger cup, just to test this out! It feels quite controversial. I’ve always just assume the cup size changed too. I love this about trying a variety of designers though. You learn new things. For months, I’ve been attempting different patterns in the hunt for one that fits well. Two were abysmal failures. After seven trials and tweaks of each, I threw them out. But this one fit me straight away and it’s a major victory. I cannot tell you what a relief this is for my sewing mojo. I was falling into a pit of despair fuelled only by sheer determination and espresso martinis (the latter wasn’t so bad. I’ll keep those going. You can find the recipe at the end of this post, just in case your sewing journey asks for it too). I don’t blame those other patterns. Plenty of people love them. It’s just that every shape is different and I don’t think they were drafted for my figure. By that, I mean the ‘golf-ball-in-a-sock’ shape. This bra lifts and supports beautifully. For the first time in my life, I actually love the rack I was given. I love how it looks in a well-fitted bra. I love how it feels when not hidden behind foam. I love that I can make more! Hubby isn’t complaining either. I can see why bra-making is so big right now. The win feels insanely good, precious fabric scraps go a long way and there’s a lot of scope for creative licence. You just need to find the pattern that’s right for you. That part can be rough. I recommend stubbornness, cocktails and Netflix. Pour into a shaker with a good handful of ice cubes and shake til icy cold. Pour through a fine sieve into a chilled glass. The vertical panel on the side of the cup helps pull the breast tissue forward and up, creating good lift and support. I love this plunge bra, but I wouldn’t recommend starting with a Merckwaerdigh pattern due to the instructions. Hope that helps with the decision at least. Good luck!! Love these! I was actually just searching for a good partial band bra pattern this morning – I’m so glad I came across these! Yay! I hope you love this pattern as much as I do. Good luck with your sewing!